Think your garden space is not quite enough for your needs? Have only a limited sunlit area? Plagued with a sore back from too much bending over to weed? Got bare walls that are begging to be used? Well then, vertical gardening is the way to go! Make the most of your garden space with delicious vegetables and fruits up on trellises and arbors, colorful flowers in towers of pots and hanging baskets, while enjoying the benefits of easy maintenance, healthy plants, effortless harvesting and high yields. ‘Trombetta’, a summer-squash variety over an 8-foot-tall arched metal trellis. Vertical gardening is any technique that utilizes various resources to allow plants to extend upward rather than along the surface of the garden. Vertical gardening can be more than just letting ivy crawl over a fence or hanging flower pots from the eaves- it brings this whole new dimension to your landscape that was being unused before! No surprises here, but vertical gardening is just what it sounds like- making plants grow upwards using a wall or trellis or any sort of support- rather than growing out and to the sides as in a typical garden. It is one of the hot gardening trends these days especially since it is applicable in small spaces, patios, porches, balconies, window sills, you name it! Heck, it even makes dull walls and fences spectacular. Through vertical gardening, you also obstruct undesirable views or create an area of architectural or aesthetic interest. -Plants growing upwards have a smaller footprint than those out in beds, i.e. saves space. – Lesser work and time in preparing vertical gardens- no tilling, no digging. 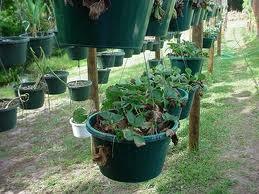 Vegetable plants hanging from pots. – Lesser bending and backbreaking work. – Better protection from soil-borne diseases and pests. – More plant varieties in smaller spaces. – Overall lesser maintenance chores. In recent years, we’ve been shown undisputable proof that fresh, homegrown organic produce is tastier, healthier and cheaper than purchasing from a store. When you think of growing vegetables you think “out”, but here we are letting your mind wander “up”! Like any garden, to start off you need to plan. Determine the location of your vertical garden depending on what plants you plan to grow. Most vegetables require at least 6 hours of the sun. Understanding the basics of growing vegetables vertical is mandatory. Almost any vegetable can be grown vertically given an adequately deep container and a vertical support that is strong enough to hold the plant with its fruit. Evaluate the conditions of your garden to choose vegetables that will thrive based on sunlight, wind, humidity and heat. Prepare to water vertical vegetables daily. Select “vine” varieties of plants when applicable. Ah, soil. You’d want weed-free, compost-rich organic soil for your vertical garden. The soil you use would of course depend on the requirement of the plant growing but in general, a mixture of fertile top soil and peat moss or perlite should work wonders. Gardeners growing vertically do so using some sort of vertical support structure or container. Trellises, pyramids, tripods, arches, arbors, fences, wire cages and frames, gazebos and walls are all commonly used structures. Even consider options such as bamboo poles, tree branches, ladders and plants with strong stems. Choosing the type of support structure would depend on the plant you’re planning to grow. For example, tomatoes would need sturdy vertical support structures, while peas would just climb over any structure without bearing much weight on it. Always place the support structure in your garden before planting the vegetables to prevent damaging your plants. Yes, more proof that planning is essential. Several containers are available for vertical gardening, including hanging baskets or hay baskets, pot hangers, cascaded pots (pots mounted on each other), window boxes, urns, clay pots and even wooden crates. The main requirement is that the container being used is deep and sturdy enough to support the type of vegetable you are growing. Drainage is important too, so if the container does not have holes, drill a few on the bottom of the container before filling it up with soil. – Pole Beans: Pole beans will climb almost any structure, including other plants. Native Americans grew pole beans alongside corn because the corn stalks provide the vertical support. – Peas: Like pole beans, peas will also climb any structure with ease and barely need encouragement to twine around vertical supports. Trellises, bamboo sticks, arches and arbors can be considered while growing peas. – Tomatoes: Tomatoes are heavy plants that require sturdy vertical supports. As the tomato plant grows, fasten the branches to the structure with a soft twine or cloth regularly. Select non-bush or indeterminate tomato types. – Winter Squash and Gourds: These have long vines that necessarily need sturdy structures to support their weight. Trellises work well for winter squashes and gourds. To provide extra support to growing fruit, wrap cloth or strips of pantyhose around the fruit and secure it to the vertical support. 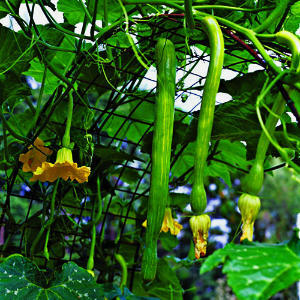 – Cucumbers: The vine variety of cucumbers is ideal for a vertical garden as they are natural climbers. A-frames, cages or trellises are strong enough to support cucumber vines. In the beginning they may need a little encouragement to entwine themselves around the vertical structure, but as soon as the tendrils attach themselves there is no stopping them. – Melons and Pumpkins: Melons and pumpkins too have long vines and their fruit will need the additional support of wrapped cloth tied to the vertical support. Vertical support can be provided in the form of any sturdy trellis or cage.